'Orange' Creator Jenji Kohan: 'Piper Was My Trojan Horse' Orange Is the New Black's showrunner explains how a story about a privileged white woman and criminality allows her to tell "really fascinating tales" of black women, Latinas, old women and criminals. Kohan also created the Showtime series Weeds. Janae Watson (Vicky Jeudy), Piper Chapman (Taylor Schilling) and Dayanara Diaz (Dascha Polanco) arrive in prison in the first episode of Orange Is the New Black. A lot of people have been binge-watching the new Netflix series Orange Is the New Black, which is set in a minimum security women's prison. The show's premise comes directly from a memoir of the same name: A white, middle-class woman named Piper, who graduated from a prestigious women's college, became involved romantically with a woman who was working for a drug ring. They traveled together on out-of-town business, and Piper agreed to carry a suitcase of drug money. She wasn't caught, but years later she was named in a drug conspiracy, convicted and sent to prison. Beyond that basic premise, Orange's writers have created a fictionalized version of Piper's story, as well as fictional backstories for the inmates Piper is serving time with. The memoir was adapted for Netflix by Jenji Kohan, who is also the showrunner, overseeing production of the series. Kohan also created the Showtime series Weeds. She tells Fresh Air's Terry Gross about the show's close-knit cast, why she chose Netflix, and what draws her to stories about privileged white women and criminality. 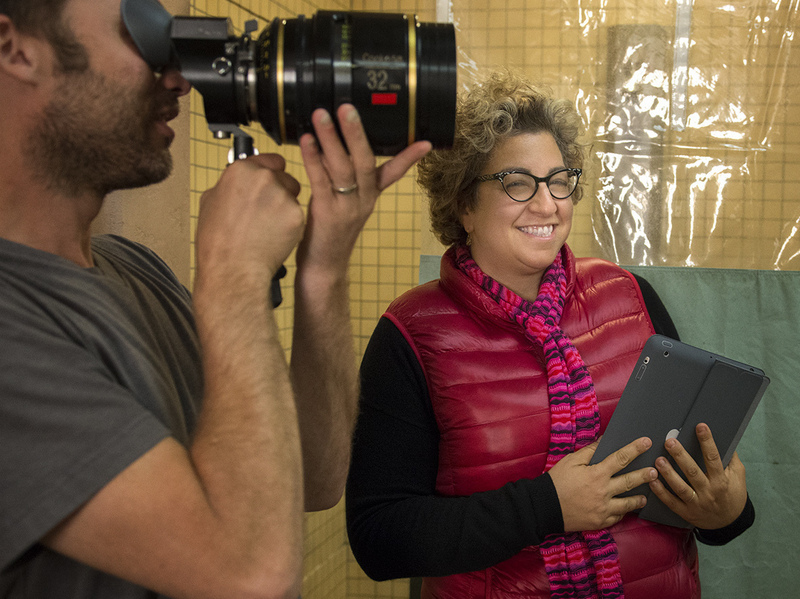 Jenji Kohan, seen here on the set of Orange Is the New Black, began her writing career on The Fresh Prince of Bel-Air. "I'm always looking for those places where you can slam really disparate people up against one another, and they have to deal with each other. There are very few crossroads anymore. We talk about this country as this big melting pot, but it's a mosaic. There's all these pieces, they're next to each other, they're not necessarily mixing. And I'm looking for those spaces where people actually do mix — and prison just happens to be a terrific one." "In a lot of ways Piper was my Trojan Horse. You're not going to go into a network and sell a show on really fascinating tales of black women, and Latina women, and old women and criminals. But if you take this white girl, this sort of fish out of water, and you follow her in, you can then expand your world and tell all of those other stories. But it's a hard sell to just go in and try to sell those stories initially. The girl next door, the cool blonde, is a very easy access point, and it's relatable for a lot of audiences and a lot of networks looking for a certain demographic. It's useful." "When you're writing a show, [it] is your life. And I did not want to spend all my days in prison. It seemed really oppressive, and potentially depressing, and I wanted to build in a structure where I could get out, and these people could get out, and we could have some blue skies and wear some actual clothes, as opposed to uniforms. The bonus of that was that you get to see a fuller picture of who these people are. Because everyone wears a mask, to a certain extent, in prison; you take on a persona to survive, and there's more to these people than what they're displaying in this extreme situation." "The wealth of talent in this pool has been remarkable. The women that Jen Euston, our casting director, has brought in are so talented, and the bench goes so deep. Like Crazy Eyes, who is one of the real breakout characters on the show — I think [actress Uzo Aduba was] No. 50 on the call sheet, and she's a star. They're all stars. And they're dazzling, and they're enthusiastic, and they adore one another. And when their scenes are done, they stick around and watch other people do their scenes, and they hang out on the weekends. It's kind of been a love-fest on the set." "I took it to HBO and Showtime and Netflix. And the greatest thing about going to Netflix was that I pitched it in the room, and they ordered 13 episodes without a pilot. That's miraculous. That is every showrunner's dream, to just 'go to series' and have that faith put in your work. They paid full freight. They were new, they were streamlined, they were lovely, they were enthusiastic about it. And I love being on the new frontier. I love being first out of the gate. It's really, really fun, because I think it is the future in a lot of ways, of how people consume media, and it's great to be in there early." "My ex-boyfriend said, 'You have a better chance of getting elected to Congress than getting on the staff of a television show.' Which was the perfect thing for him to say, because my entire career is, 'Well, screw you.' And we broke up. And then I started writing. ... I quit all of my crappy odd jobs, and I moved in with [a friend who] was living in Santa Cruz. And every day we would go to these little cafes in Santa Cruz, and I would work on spec scripts and study these videotapes I had recorded off television of Roseanne and Seinfeld and The Simpsons. ... What ended up happening was, my sister-in-law's father worked in a building with an agent and gave him my scripts in an elevator. And he read them, and I was on a show by spring. And it took off from there, and I never stopped working." "I'm a huge Ira Glass fan; I'm a huge fan of radio in general. I don't have a whole lot of time to watch TV, but I'm a big podcast listener, a big radio listener and a fangirl to a certain extent. ... [But] in terms of storytelling, we wanted a way for all of the prisoners to be able to experience [Piper's fiance's] betrayal. He's sort of co-opting her experience to make himself feel useful and special, and radio was a great way to do that. ... I find This American Life so compelling, and I engage on a very deep level with these stories, so I wanted that in our show — where everyone is quiet and listening."